The events are also well known for the champagne that is used in the last stage of polishing. It is the acidity in the champagne that is key, removing the last vestiges of oil from the surface of the shoe to give it that extra shine. This, the firm admits, could be achieved with any wine. But champagne does add a certain romance to the whole enterprise. These events are something that the new UK retail manager at Berluti in London, Lorenza Cavalli, is keen to build on. They foster loyalty to the brand and help Berluti keep in touch with its clientele. Indeed yesterday and today (September 25 and 26), Berluti is inviting its customers to drop by the shop for a drink (it is open until 7:30), let the staff take a look over their Berlutis to provide advice, and get a new pair of shoelaces for them. It is amazing how many men are happy with old, frayed laces – even those that spend an inordinate amount of time polishing the shoes. Berluti is also planning more polishing evenings at the London store, so look out for these in the coming months. Indeed, Permanent Style has already been invited to the first such evening – so watch this space for tales of debauchery, patina and polish. Cavalli is new to menswear, her previous job being in the bespoke department at stationer Smythson and other jobs including watchmakers Ebel. But she still says she feels right at home with men’s shoes – something about the fascination that men who truly love their clothes bring to luxury houses like Berluti. “The customers are so interested in the products, in the technical side of them, in the history and the ethos of the company. It is a lot less flighty and trendy that womenswear,” she says. 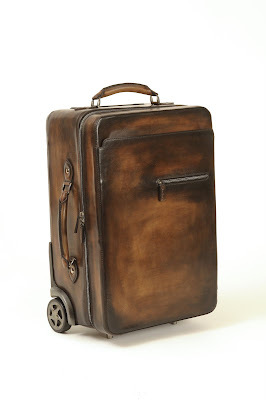 In other Berluti news, the firm has just launched its new luggage. This is in the Venezia line, the same as the famous Un Jour bag (both pictured here). The design is similar in that it is a simple leather without much ornamentation, just a characteristic patina. The wheels, modelled after those of racing cars, also make it very manoeuvrable, while the thin leather makes it extremely light – lighter than a lot of other non-leather luggage. You can follow the discussion on Berluti polishing events, and luggage by entering your email address in the box below. You will then receive an email every time a new comment is added. These will also contain a link to a page where you can stop the alerts, and remove all of your related data from the site. Interesting that you mention the weight and thickness of the leather. 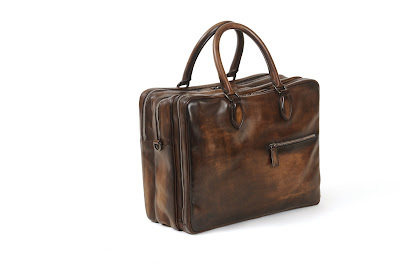 I’ve recently purchased a small briefcase from Saddleback Leather of Texas, USA, whose works are certainly not designed with the same aesthetic in mind as Berluti. That Berluti briefcase is classic, yet the zipper bothers me, as do the wheels on the luggage, no matter how functional they may be. The patina is quite nice as well. I wonder about your thoughts on Saddleback. They may be viewed on their website at http://www.saddlebackleather.com, and while I am myself a customer, and hope this reads merely as a contribution to a discussion on leather goods and not a pitch of any sort, I do find myself wondering about the various compromises luggage makers fall victim to when modernizing their goods. As for the boots: I may have to sign up just to partake in that auction. Gorgeous. Champagne? Really? I have to try that on my next shine. Great article. I’ve always admired Berlutti shoes, and can’t wait for my next trip to France to get fitted. I especially liked the observation how men appreciate the technical aspects of our footwear-it yields more depth to our appreciation.